I have to admit that in my quest for keto pull apart bread recipes, I have definitely missed the convenience of being able to just buy premade bread or dough to use as a starting point like I did pre-keto. However, it was hard to be disappointed after pulling this out of the oven! It’s a tiny bit tricky to make and shape the dough yourself, but the end result is so worth it! Who can complain about a golden brown Christmas tree filling with cheesy, basil-y deliciousness? This keto Christmas tree bread is a good, satisfying accompaniment to your favorite winter soups, although it also makes a surprisingly filling lunch on its own as well. 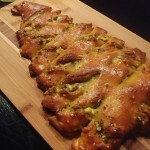 If you feel like sharing, I’ve also found that the tree shape and flavor makes it a pretty popular party food among keto-ers and carb eaters alike. Need something to take to a holiday party but want to keep it keto? 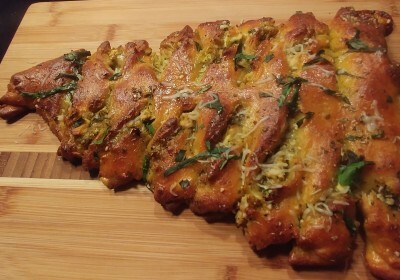 This keto Christmas tree bread filled with chicken, pesto and cheese is perfect! Per serving: 250 calories, 20g fat, 15g protein, 3.7g total carbs – 1.4g fiber = 2.3g net carbs. Combine garlic butter ingredients and set aside. Cover the dough with a damp cloth/paper towl and allow to rise in a warm place for 10-15 minutes while you prepare the filling. Filling: In a bowl, mix together cheeses, chicken, and pesto. Add salt and pepper to taste. Set aside. 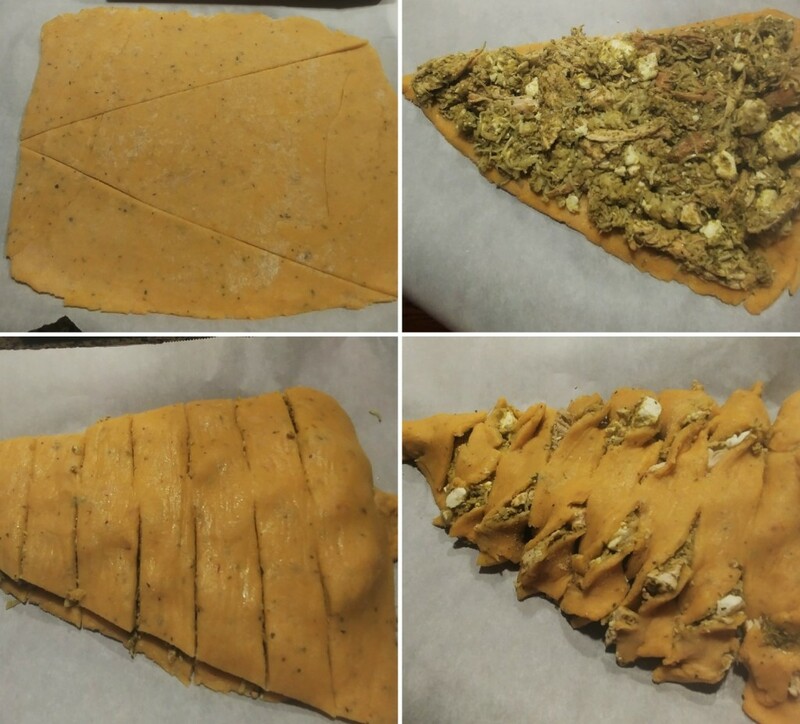 Roll dough into a rectangle, about 1/4" thick. Make two diagonal cuts from the center of one "short" side of the rectangle to the corners of the opposite side (see pictures for guidance). You will end up with one large triangle in the center and two smaller triangles on the sides. Press the straight sides of the two smaller triangles together to form a larger triangle to match the size/shape of the center one. This will be the "bottom" of your bread. Optionally, press the seam downward to make a "trunk" for your tree. Layer the filling on top of this dough layer, leaving a little space around the edges. Top with the other large triangle of dough. Make horizontal slices on each side of the tree, being careful to leave them connected in the center. Carefully pick up each "slice" and twist 1-3 times (depending on the length). Bake in the preheated oven for 25-28 minutes, or until golden brown. Brush with garlic butter before serving. Best served warm. Store refrigerated for up to 5 days. Reheat in the microwave or in the oven at a low (~300F) temperature. In addition to the garlic butter, I usually top this with some extra parmesan and chopped fresh basil right out of the oven. Don’t worry too much about making the dough twists perfect; the way it rises in the oven will smooth out most imperfections. If using store bought pesto, be sure to check the carb count! I’ve seen some with inexplicably high carb counts from adding unnecessary sugars and starches.